Honey may be used as a spread on toast, hot cakes, muffins, crackers, pancakes. Honey mixed with lemon juice and hot water may be helpful to soothe a sore throat. Honey is a flavour boost when added to French style salad dressings; mix with olive oil and balsamic vinegar in a 2/1 ratio or according to personal preference. Honey is naturally acidic and makes a wonderful marinade for meat; mix together with soya sauce and garlic. Honey is great as a glazing for meat; drizzle over the meat just prior to the end of roasting. 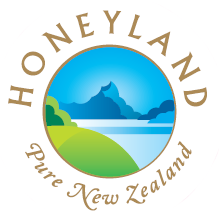 We recommend our Rewarewa Honey for a delicious glaze. Honey can be used in baking, as a substitute for sugar in order to keep cakes fresher and moister for longer. Honey is an ideal substitute for sugar to sweeten drinks such as tea, herb tea, coffee. Unlike most other sweeteners, honey contains a variety of antioxidants, vitamins, minerals and amino acids. Honey added to cream makes it taste better and keep longer. Our Clover Honey has a light, delicate flavour which is perfect to mix with cream. Honey can be helpful for good sleeping. Stir some clover honey into a cup of hot milk just before retiring. 65 Calories per serving, 0% Fat. Note: Honey is a safe and wholesome food for children and adults, however it should not be fed to babies under one year old. Visit our Recipes section for some delicious ways to cook with honey.